A new era of social, or just common sense? 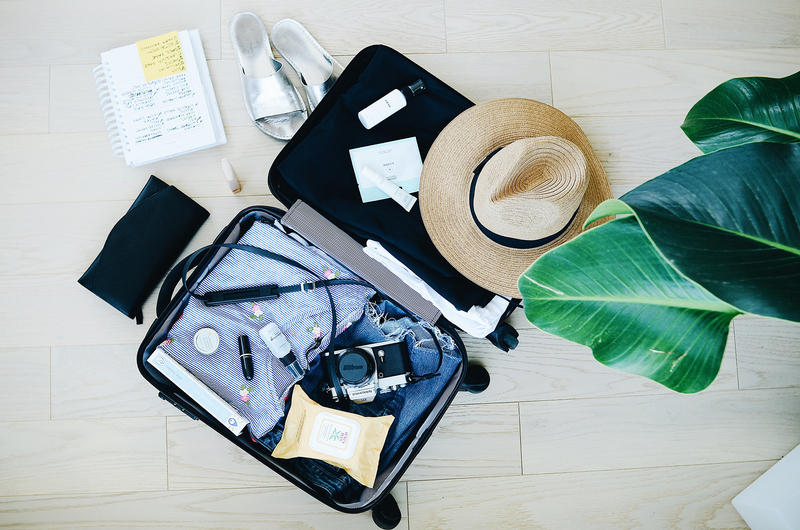 Social media can be a highly targeted channel for attracting your audience, but with Facebook signalling changes to their algorithm, what does that mean for tourism brands? Essentially Facebook is giving more prominence to content that encourages interactions and comments. When put in such simple terms, it’s hard to see what the panic is about. There is now a greater emphasis on engaging your audience with unique, authentic and meaningful content. Ok, so what does this specifically mean for brands and advertisers? Many within the industry will be feeling the pressure. It will no longer be enough to post content aimed at getting attention. That montage of inspiring destination images which generates a flood of ‘likes’ will not hold the same level of weight anymore. Rather, content needs to invite your audience to discover more. You need to say something that sparks a conversation. An anecdote that piques your audiences’ interest. A hint at a unique experience, or an adventure that awaits. It comes back to the fundamentals of storytelling. 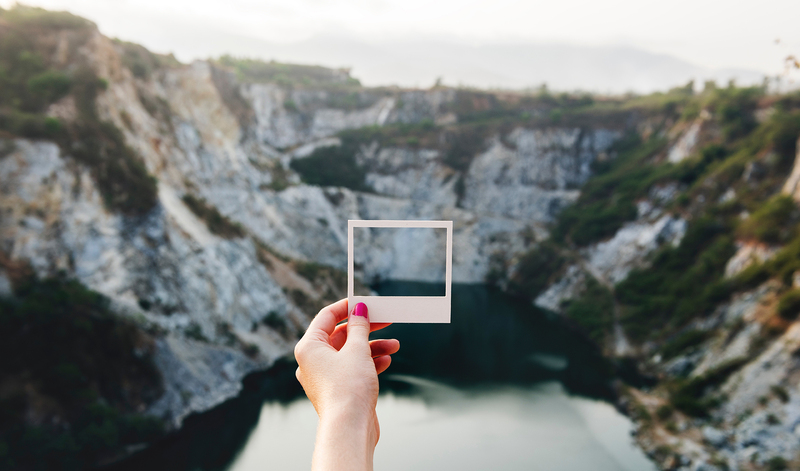 Storytelling is not you ‘pitching’ your brand or destination to people, it’s about sharing something that makes them think, or makes them feel. Now let’s think about Maps for a moment. Maps are powerful storytelling platform that can invoke feelings of curiosity, dreaming and anticipation. As once described by Miles Harvey – “A map provides no answers. It only suggests where to look: Discover this, reexamine that, put one thing in relation to another, orient yourself, begin here.” It is about inviting discovery, exploration, and opening your readers’ mind to the unfamiliar. When we look at their use within social media feeds, at the top level they have the ability to create intrigue, encouraging readers to want to find out more. But below the surface, they break down the irrational barriers to exploration, and spur your audience to take action. 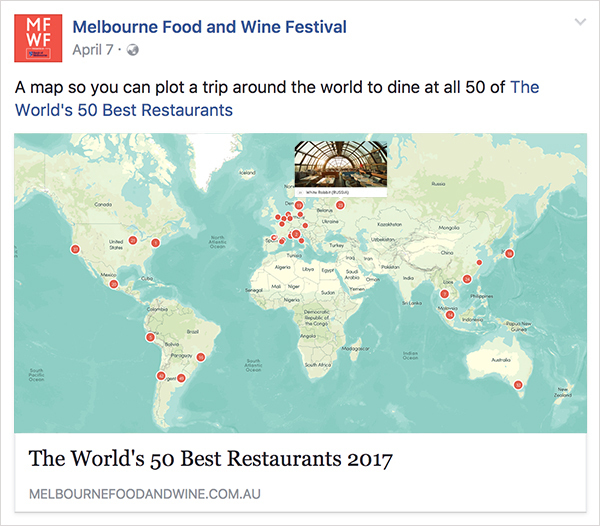 Melbourne Food & Wine Festival shared their ‘World’s 50 Best Restaurants’ map across Facebook in April 2017. The post resulted in a 500% increase in ‘Likes’, but more importantly, a 1300% increase in ‘Comments’ (when compared to their average post engagement). In addition to presenting inspirational content, this post broke down the barriers of planning (Where is it? How do I get there? How do I make it happen? ), and provided sharable, actionable content that someone could grab and hit the road with.